Has radio killed the Spotify star? 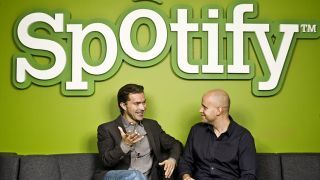 Spotify has somehow convinced the music bosses of the world to unlock streaming play on mobile devices for free, with subscription-dodging freeloaders now able to listen to their playlists for nothing via its Android and iOS apps. It's slightly hobbled in that the mobile player is playlist based so it's impossible to search for and listen to individual tracks on demand, with this new mobile Spotify experience offering a sort of radio-style, you-get-what-we-give-you approach that's bound to anger today's but-I-want-everything-now consumers. Still, the launch of the shuffling radio player sees Spotify beat Apple's much discussed and still not available iTunes Radio to the UK market, and the tablet app is more versatile still, so presumably everyone's happy for once about this innovation in being given stuff for free in return for enduring adverts? Not really. It's the internet after all, where everyone's perpetually as miserable as a man who's been underpaying his electricity bill for a decade and has just received the reminder. Over on The Verge, the race to be the most cynical early commenter was won by Kobayash, who offered this reasoning for the adjustment in Spotify's services: "Translation: We are withholding features in order to steer users toward the paid version, but with desperately attempt to spin this as a positive." Which seems a fair enough description, as there's nothing technically stopping Spotify from putting a full radio player on a phone. Beneath Spotify's own announcement of the changes, there was something we suspect may have been posted by Thom Yorke but using the alias Gboyd2013. He makes the claim: "Free at last! This #FreeYourMusic from Spotify is just another brick in the wall that may have the unintended side effect of 'enslaving' the music artist community. As they say 'one man's freedom is another's slavery'." Maybe it's Prince, actually. Thom Yorke or Prince. Beneath the app's listing on Google Play, no one seems particularly impressed by the freemium road Spotify seems to be going down. Reader Alexis Williams, posting bitterly under the headline of "False Advertising," said: "When I downloaded this, I expected to be able to do all the things I did on my computer. And I could. For a week. Apparently I get a weeklong trial of the premium subscription I didn't ask for. Now I can't pick which song I want to hear, I have to stay in shuffle mode, which doesn't even play all the songs in the playlist. I'm deeply considering uninstalling." Alexis was also unimpressed by the limitation in skipping tracks, which applies to radio tracks and ones collated from your own personal library. Maybe Spotify could start selling "Skip Packs" at, say, £9.99 for 500? And on Cnet, reader Corelogik is not having any of it. It's a conspiracy. A conspiracy to get us all streaming data. Not sure who that would service, but still. It's definitely a conspiracy, with Corelogik raging: "In the era of bandwidth and data caps, I refuse to use any streaming service any more than I have to. I will keep MY music in MY library on MY device and I will decide how and when and what I listen to thank you very much." Surely it's more about laziness, Core? Installing an app and using the cloud means freedom from having to shuffle gigabytes of music around every time you switch devices. Paying for the privilege of it, though, of course. Also getting on a bit and resistant to change is Lensman888, who appears to spend all of his time in a car or sitting next to a radio with a toy steering wheel on his lap. He mocked the new wave of streaming listeners with: "If I want to listen to music I take one hand off the steering wheel, turn a button and like magic music appears. Not going to mess around with this is free, this isn't, you can do this, you can't do that, dropped connection here, low battery there... Jeez people make their life so complicated." Meanwhile, on Digital Spy, reader Jengstrm suggests Spotify is indeed doing it for the kids, not people stuck in their ways like Lensmann and Corelogik, as it searches for a way to make money from a thing young people have become used to accumulating vast stacks of for free. Jengstrm said: "The real story is the companies like Spotify are desperate for a viable business model because kids don't want to listen to crappy music or pay for it, so, they turn to sites like YouTube and Smashpipe." So deliberately hobbling a free thing to lure a small percentage of people to pay for the full feature set is the way forward for music. We look forward to seeing how the film industry can adapt to the freemium business model next. Inflame is TechRadar's weekly look at beyond the fold - the best comments from technology's most popular stories.